To demonstrate the effects of induced polarization on geophysical measurements, consider a specific example where a current generator, hooked to the ground as in a DC survey, is turned on. 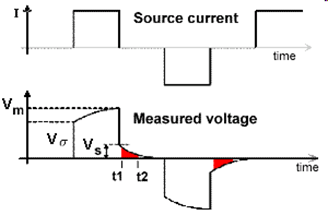 At some location, the electric potential (\(V\)) is measured. In non-chargeable rocks, an instantaneous increase in the measured potential occurs when the source is switched on. When the source is switched off, the current through the Earth returns immediately to zero and so is the measured potential. This is illustrated in the figure below. where \(V_s\) is the amplitude of the over-voltage and \(\tau\) is a constant which determines the rate at which the induced polarization forms. This decaying off-time potential is commonly called the discharge curve. We use the discharge curve to characterize the chargeable properties of the Earth.